The mortal remains of the former Secretary General of the United Nations (UN), Busumuru Kofi Atta Annan, was finally brought to Ghana yesterday. The body, which was in a casket draped with the UN flag, was transported from Zurich, Switzerland where the former UN chief died after a short illness. President Akufo-Addo and his wife Rebecca received the body on behalf of the government and people of Ghana at a solemn ceremony held at the Kotoka International Airport (KIA). Anxious local and international journalists besieged the airport before the aircraft landed. President Akufo-Addo and his wife Rebecca wore all-black attire to signify their grief. Moments later, Vice President Dr Mahumudu Bawumia also arrived at the location. 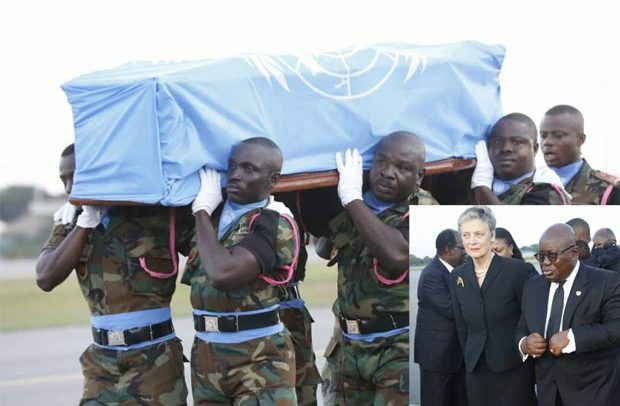 The body of the former UN Secretary –General was accompanied by his widow, Nane Maria Annan and their children. Officers of the Ghana Armed Forces (GAF) later lowered the casket from the plane, which was followed by the pouring of libation as well as Christian and Muslim prayers. The UN flag was replaced with the red, yellow, and green flag with the black star at the middle; the flag of his motherland, Ghana. The body was later conveyed to the Accra International Conference Centre (AICC) where it would be kept until interment at the military cemetery on Thursday. The former UN Secretary General would be given a state burial which would be attended by dignitaries across the world. The Ghana Armed Forces (GAF) Band provided music at the ceremony which was attended by other dignitaries like the Speaker of Parliament, Prof Aaron Mike Oquaye, Chief of Staff, Frema Osei-Opare, Senior Minister, Yaw Osafo Maafo, Defence Minister, Dominic Nitiwul, Interior Minister, Ambrose Dery, Trade Minister, Alan Kyerematen, Information Minister designate, Kojo Oppong-Nkrumah and heads of the various security agencies. A nine-member committee, headed by a distinguished diplomat and former secretary to the Cabinet of President John Agyekum Kufuor, Ambassador Annan A. Cato, has been tasked to plan a befitting burial for the top diplomat. The committee was constituted in consultation with his widow, Nane Maria Annan, children and family members. Other members of the committee are Cecilia Abena Dapaah, Minister for Sanitation and Water Resources, Kojo Oppong Nkrumah, Information Minister Designate, Ambassador Mercy Debrah Karikari, Secretary to Cabinet, Ambassador Ahmed Hassan, Director of State Protocol and Samuel Kumah, Chief of Protocol at the Ministry of Foreign Affairs. The rest are Brigadier-General Charles Awity, Director General of Personnel Administration of the Ghana Armed Forces, Ambassador Patrick Hayford, retired UN official, Kojo Annan, son of the late Kofi Annan. Nana Mensah, Director of Protocol at the Office of the Vice President, would serve as Secretary to the Organising Committee. Mr. Annan died in Switzerland on August 18, 2018.